PuLMo, a miniature artificial lung, mimics the response of the human lung to drugs, toxins and other agents. The public is invited to learn about PuLMo and other technologies developed by Los Alamos National Laboratory at the DisrupTech showcase July 14 at the Los Alamos Golf Course Event Center. LOS ALAMOS, N.M., July 6, 2016—New technologies emerging from Los Alamos National Laboratory that address everything from fusion energy to medical testing will be on display for members of the community, investors and business leaders at the DisrupTech showcase, Thursday, July 14, starting at 1:00 p.m. at the Los Alamos Golf Course Event Center. “We call it DisrupTech because we’re showcasing technologies that have the potential to disrupt existing markets or even create new ones,” explained David Pesiri, head of the Laboratory’s Richard P. Feynman Center for Innovation, which is co-hosting the event. “At Los Alamos, scientists are working every day to develop new technologies to solve the world’s biggest problems. This showcase is a chance to shine a spotlight on that work and help link science and industry.” The New Mexico Angels, the state’s leading angel investing group, will co-host the event. DisrupTech sponsors include the State of New Mexico Economic Development Department and Technology Ventures Corporation as well as the New Mexico Start Up Factory II, Phase One Ventures LLC, Los Alamos Chamber of Commerce and the Regional Development Corporation. Pulak Nath and Jennifer Harris present PuLMo, a breathing “lung” bioreactor. 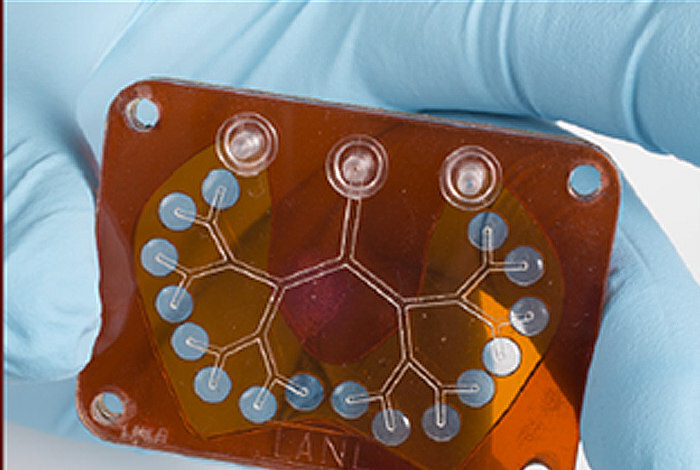 This technology mimics critical functions of the human lung and can be adapted to develop other organs for use as a testing platform to study the effect of a wide range of chemicals on the human body. It could significantly reduce the time and costs associated with bringing a new drug to market. Youzuo Lin presents how to employ a big-data technique to accurately locate and explore geothermal energy. Nine western states together have the geothermal potential to provide over 20 percent of the nation’s electricity needs. Lin’s research provides a novel, machine-learning-based, multi-physics solution for an accurate characterization of the subsurface reservoirs. Dylan Harp presents technology to evaluate the reliability of predictive models on rare events. Scientists and engineers develop predictive models using the data they have. But when extreme events occur far outside of past experience, the models’ predictions are often revealed to be grossly inaccurate, with disastrous consequences. Harp’s technology is used to understand the robustness of decisions subjected to potential extreme events. David Thompson presents a technology that could revolutionize high-time-resolution, low-light imaging. This improved imaging could be used for national security, scientific, medical and commercial needs, including auto and aviation collision avoidance and autonomous operation, as well as medical imaging. Scott Hsu presents an alternative nuclear-fusion approach as a baseload power source to reduce our dependence on fossil fuels, which are limited in supply and contribute to carbon emissions into the atmosphere. Hsu proposes developing nuclear fusion as a safe, secure, economical and carbon-free form of electricity production. Tickets to DisrupTech can be purchased at www.LANLDisrupTech.com. Above: Tiny artificial alveoli chambers inflate just like those in a real lung in PuLMo, a test bed for the effect of chemicals on the human body. This fully functional, miniature artificial lung is just one of the potentially high-impact technologies researchers at Los Alamos National Laboratory will present July 14 to the public and investors at DisrupTech in Los Alamos.